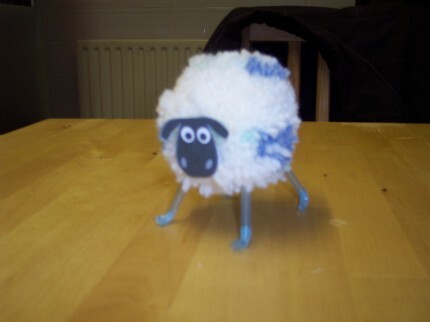 There's something ironic about making a sheep from wool, but it does have a certain obvious ring about it. 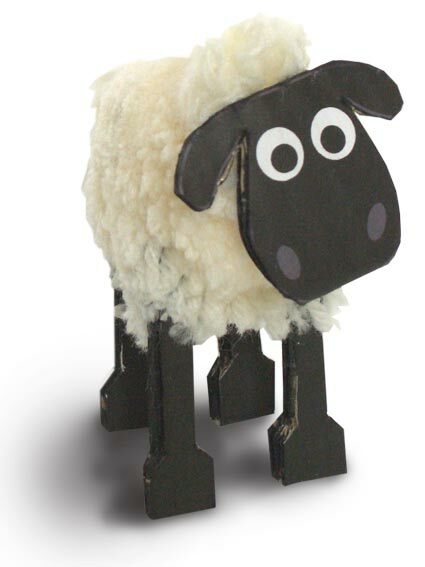 This FREE download includes the template for the wool rings you’ll need to make your pompom sheep and special image printouts (ready to be cut out) for the head and legs (lower down on this page). Don't worry if you don't have white or cream coloured wool, pompom sheep come in all the colours of the rainbow.
. . . You could make a whole farm of sheep, just like Gromit’s friend Shaun and his gang, and what’s really cool about pompoms, is that you can really shear them (ok, trim them with scissors) to make them look as shorn as you want. 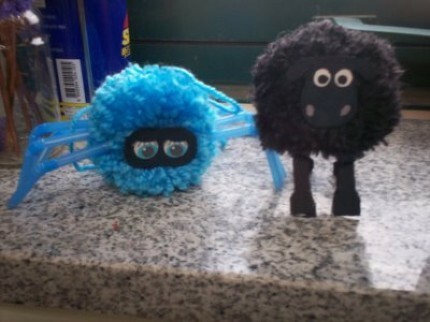 Look what happened to our pompom sheep when we took our kitchen scissors to it! 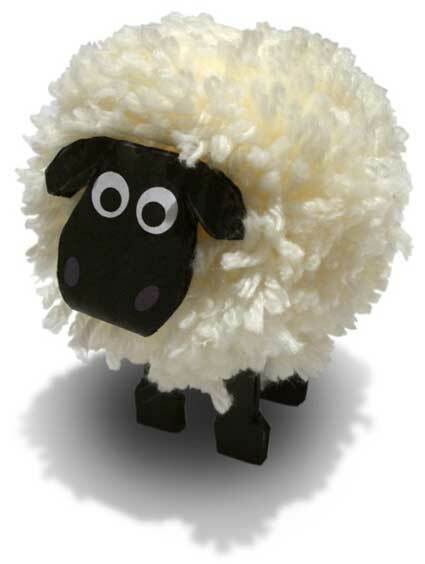 If you really want to make your pompom fluffy sheep look just like Shaun, before you stick the legs on your pompom sheep, have had a look at our latest advanced model of Shaun the Sheep. 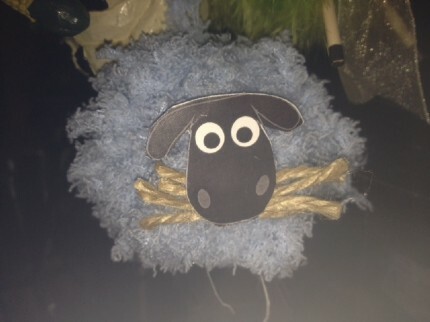 All you need is an old sock and a glue gun and your sheep will have a woolly jumper to keep him warm, just like Shaun’s. And now you don't even need wool to make a pompom, so you can get going on this project right away! An orange sheep... I don't think so, but then plenty of plastic carrier bags come in white, and if you use a black bin liner (refuse sack) then you really could make the black sheep of the family. 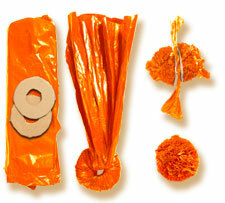 Yes, a great way to reuse those plastic grocery bags, is by using them to make your pompoms. If you tie off the pompom with more plastic bag, then you can still recycle the finished pompom as if it was a normal plastic bag. 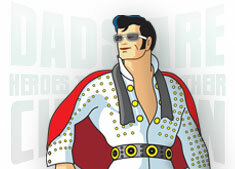 You can also use black, white or green dustbin liners, or sandwich bags, which come in a range of subtle colours. Plastic bag pompoms will work for any of the Funky Pompom projects on dadcando. To make them all you do is replace the wool steps with the plastic bag. To make it easier to thread, you might want to cut the bag into wide strips, but as long as you can thread the bag through the centre of the discs then it's ok. A plastic bag pompom has a glossy slippery finish that is much softer than you would imagine and is a good alternative to wool. The pompom instructions and printable graphic templates are so simple to follow. They give amazing results and are available in either A4 or US Letter formats, just click on the size you need to download. Posted by justmakebelieve - Shaun with his (highly inferior) plastic lookalike! Posted by birdbasket - I work with Preschool children at the library. 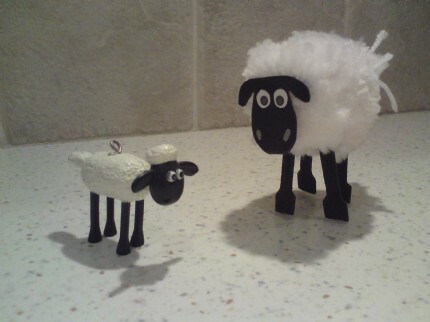 We made these sheep the "right" way and then one little guy made his like this. Either way works for me! Posted by cihuacatzin - shhhh! she is almost sleep! Dadcando has some truly amazing funky pompom projects, and making a pompom couldn't be easier or more instantly rewarding. 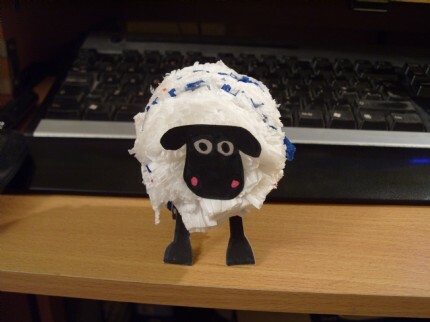 You don't even have to have wool, you can make a pompom from any lightweight plastic bag, bin-liner or sandwich bag. 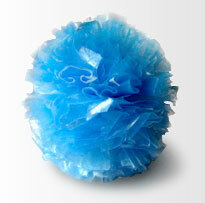 This tiny little pompom was made from a transparent blue plastic sandwich bag. 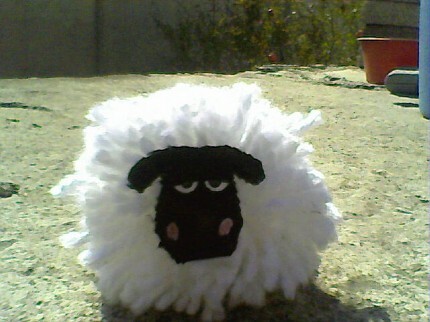 Perfect for making little pompom creatures to decorate the top of your pens and pencils. All you need is a piece of cardboard, which you cut into two same sized rings. 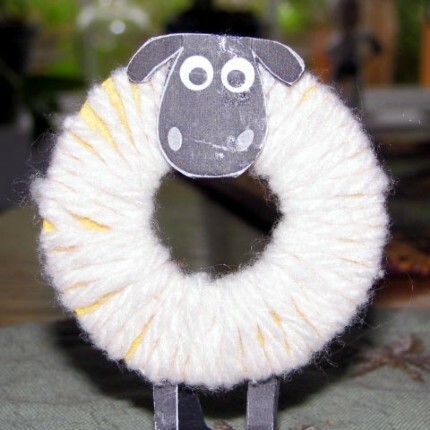 You bundle up some wool into 2m lengths and thread them through the rings about 8 at a time (or a plastic bag). Keep threading the wool through the ring until you can't fit any more through. Push the tip of a pair of scissors into the wool and between the discs inside and cut round the rim. Tie a few lengths of wool round the pompom bundle between the cardboard discs and then remove the discs by slipping them off the wool or cutting them. That's it. 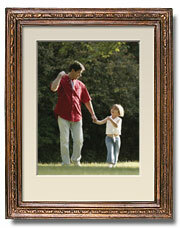 It couldn't be much simpler, but it is only the start. 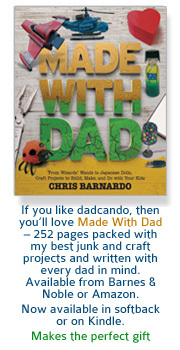 Both boys and girls love making pompoms and dadcando's projects have easy to follow instructions and the beautifully designed printed image patterns will make sure that your pompom looks fabulous as well as being something really wacky and memorable, and they’re all so quick and easy to do. So, beg or borrow a ball of wool off someone to get you going, or visit your local fabric shop and buy a ball or two. There are some crazy wools out there, have a look at the wonderful pompom William designed in Your Models, using a fun multicoloured wool. I guarantee once you start making pompoms with your kids, they won't want to stop.